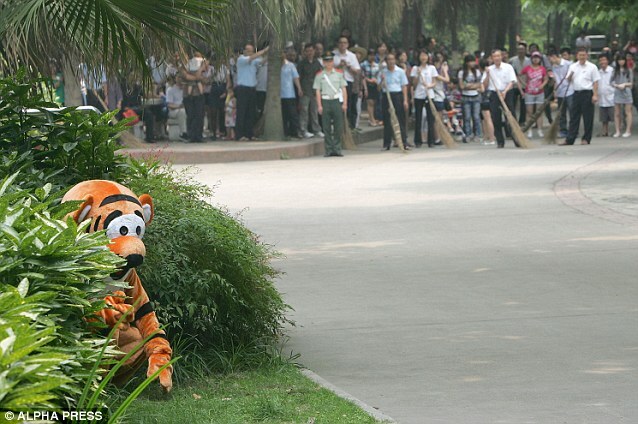 How Chinese zoos prepare for potential tiger escapes revealed! It would appear that there is no other nation on earth that enjoys dressing up in cheap looking panda costumes more so than China, a topic previous posts I have addressed (see here and here). 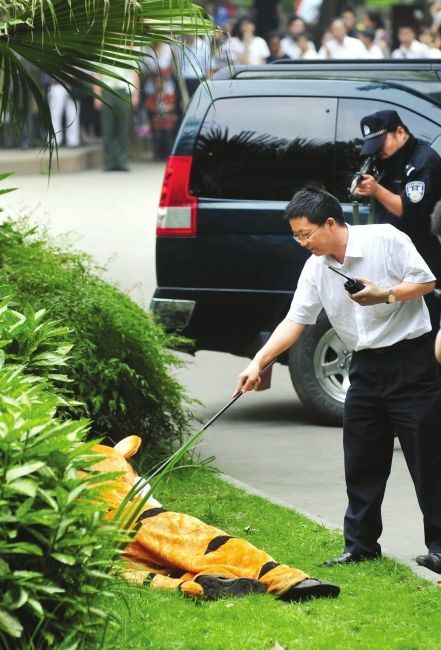 Yet more evidence for Chinese people’s penchant for donning furry outfits has popped up on the web. However, tastes have evolved somewhat and people are no long content with just imitating pandas. 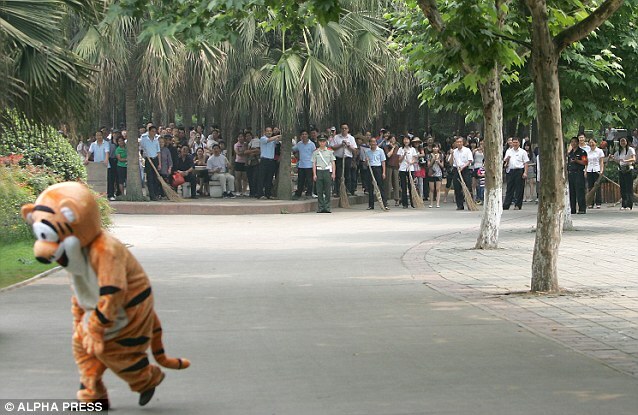 Two members of staff at Chengdu Zoo, southwest China, recently wore tiger costumes and took part in a safety drill aimed at teaching staff what to do should a tiger ever escape its cage one day. 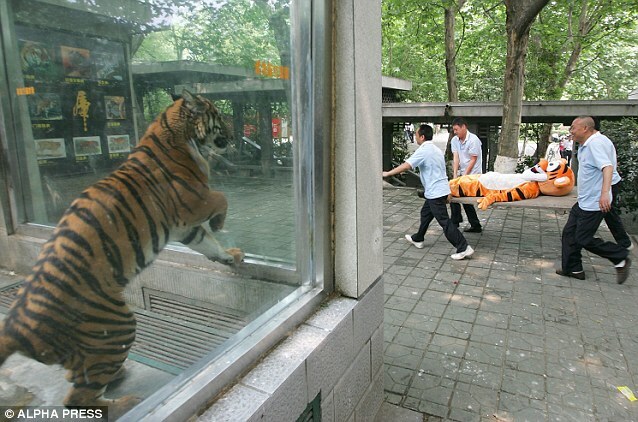 and finally carried off on a stretcher in full view of bemused real tigers. Obviously a human in a costume is far less dangerous, more compliant and predictable than a confused and angry 650 lb beast with claws and teeth that would make you weep/soil yourself. Incisors, talons and sensibilities aside, it was obviously more of a publicity stunt than a proper training drill (surely…? Because don’t zoos have to evacuate visitors if a carnivorous animal escapes?) 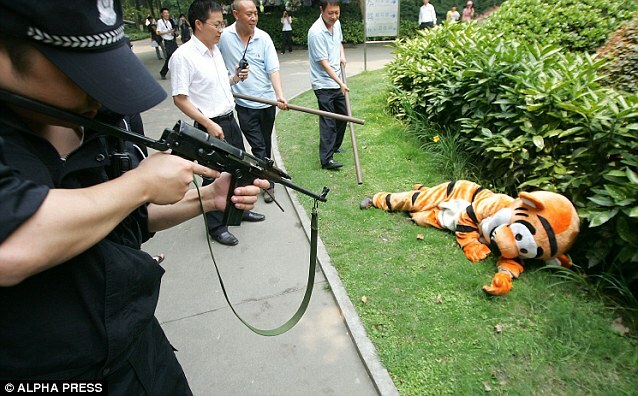 and actuallyan idea that was insprired by Japan’s Ueno Zoo.